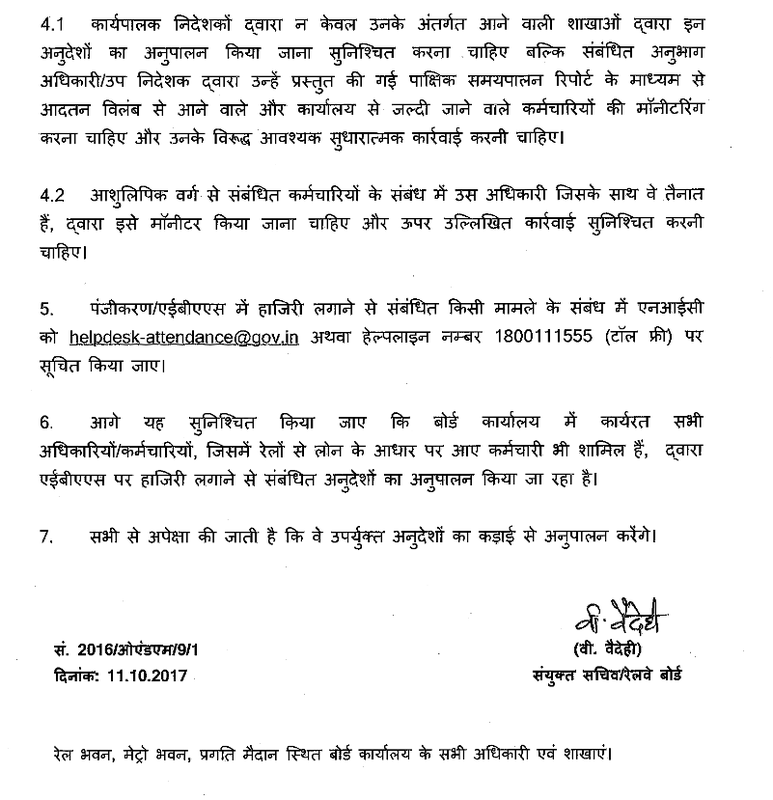 Instructions for adhering to punctuality in attending Office have been issued from time to time, along with instructions on proper monitoring. Biometric Attendance System was introduced under Office Order No. 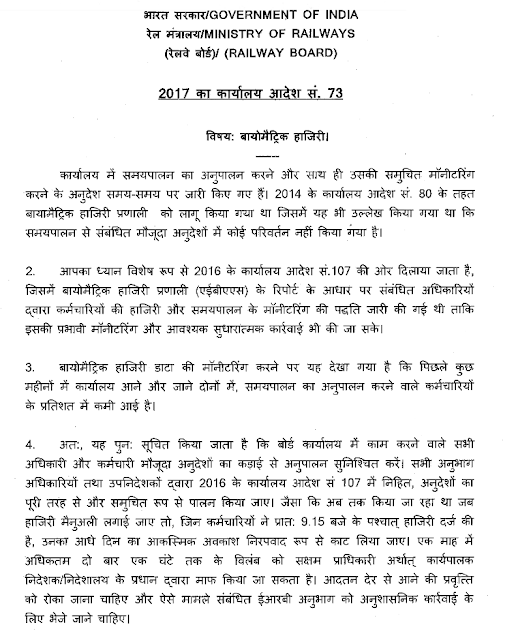 80 of 2014 which also brought 01:11:- that there is no change in the existing instructions relating to observance of punctuality. 2. Attention is specifically invited to Office Order No. 107 of 2016, wherein the method of monitoring of attendance and punctuality of employees by the concerned Officers, on the basis of reports of Biometric Attendance System(AEBAS) was issued for effective monitoring and taking necessary remedial action. 3. On monitoring of Biometric Attendance Data, it is observed that over the last few months, there has been a“ declining trend in percentage of employees in maintaining punctuality, both in respect of reaching and leaving office. 4. It is therefore, reiterated that all Officers and staff working in Board’s Office may ensure strict compliance of extant instructions. Proper monitoring as contained in Office Order No. 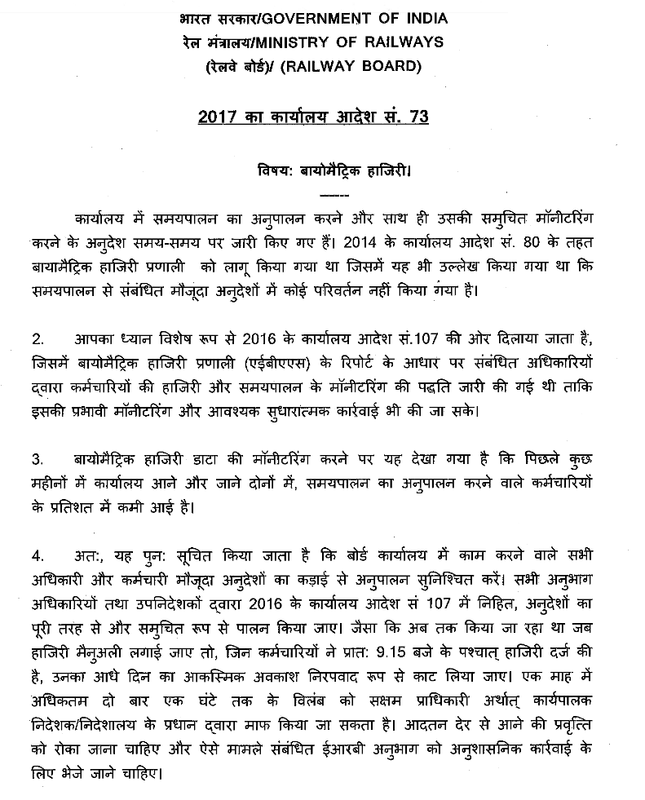 107 of 2.016 be strictly adhered to by all Section Officers & Deputy Directors without fail. ' As was being done hitherto when attendance was being marked manually, deduction of half-a-day's CL may invariably be ensured. against those who have recorded attendance. after 9.15 AM. Also, on not more than two occasions in a month, late recording upto an hour may be condoned by the competent authority viz. Executive Director/Head of the Directorate. Habitual late coming should not be allowed and the matter may be reported to the concerned ERB section for disciplinary action. 4.1 Executive Directors should not only ensure compliance of these instructions by the branches Working under them but should also monitor and take necessary remedial measures against habitual late comers or those who leave office early, through the fortnightly punctuality report to be submitted to them by the concerned Section-Officer/Deputy Director. 4.2 ' In respect of stenographic’: official, the officers with whom they are attached are to monitor the same and ensure action as stated above. 5. Any issues relaied to registration/marking of attendance in AEBAS may be reported to NIC at helpdesk-attendance@gov.in or over the Helpline. NO. 1800111555(TollFree). 6. It may further be ensured that marking of attendance of AEBAS is to be complied with by all Officers/staff working in Board’s Office including those working on loan basis from Railways. 7. Strict compliance of above instructions is expected from all. All Officers/Branches’ in Board’s Office and at Metro Bhawan, Pragati' Maidan.